There is neither shouting nor calling in the barn. Just one of the waiting cows is mooing and some muted music can be heard from a radio in the distance. Calmness and silence have priority in the cow house. Nobody waves about with his or her arms, startling the animals. 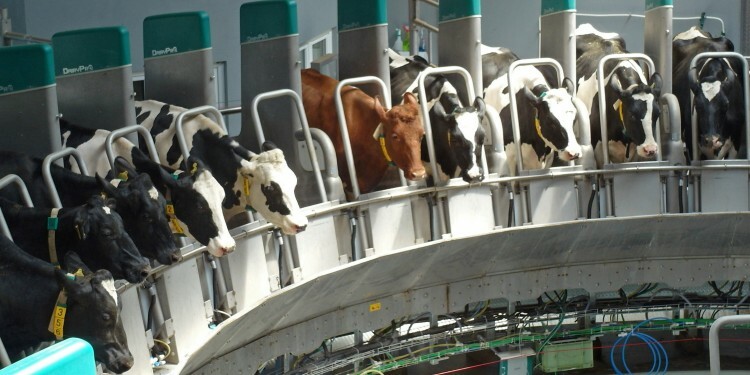 The milk cows do not have to be lured, chased or pushed into the boxes of the slowly rotating milking plant. “Well-behaved”, like English gentlemen waiting patiently at a bus stop, they stand in line in front of the metal gates, knowing that invisible “hands” will soon come from below, attach to their stout udders and stimulate teats before the milking process starts and the first of the four robot cups has attached. 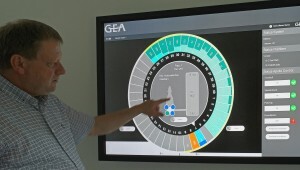 “The brand-new, computerized milking plant, which is full of patented technology and has been shaped in an animal-friendly design, is the most modern one of its kind in the world,” Eckehard Blöttner, managing director of the Thuringian agricultural cooperative explains. 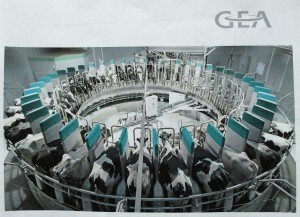 “The animals have learnt to accept and use the milking plant in only three passes. They are totally stress free and show this by giving more milk than in the months before.” Obviously, the cows prefer to be milked by robots that work more gently and steadily than human hands. By means of a three dimensional camera, the robots first measure the cow teats, so that the milking cups can automatically be attached as soon as the cow has entered the box. After teats have been cleaned, the quality and cleanness of the milk are checked in a pre-milking procedure before the actual milking process starts. All this happens in only one operation, while the milk is pumped through the pipes of guardrails into the huge polished stainless steel tanks in an adjacent cold storage room. After twelve minutes, the teats are automatically dipped to prevent inflammation and to protect the udder from germs and microbes. The cows seem to perceive when the milking procedure has finished. On their own, they back out of the boxes, turn around and head to the barn again. While cows were milked by milkmaids for hours, several times a day in the past, only one employee is now necessary to operate this high-tech milking plant twice a day, and it only takes two hours to milk all 382 cows that currently live on the dairy farm. “This way the animals have more time to rest and can ruminate in peace and quiet,” cattle breeder Mike Müller says, who is just observing and checking the data on a large touch screen that shows the pressure of air and water as well as other important information coming from every box during the milking process. 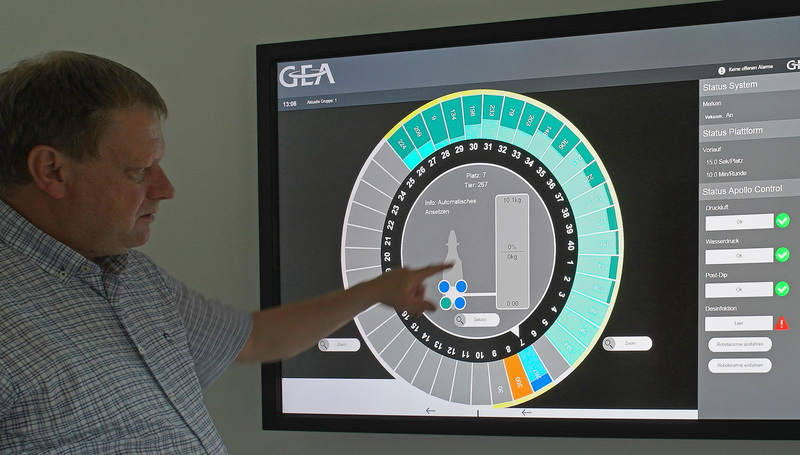 The new milking plant DairyProQ made by GEA Farm Technologies GmbH in Bönen, about 30 kilometres (18.5 miles) northeast of Dortmund, North-Rhine-Westphalia, totally changes the traditional milk production. 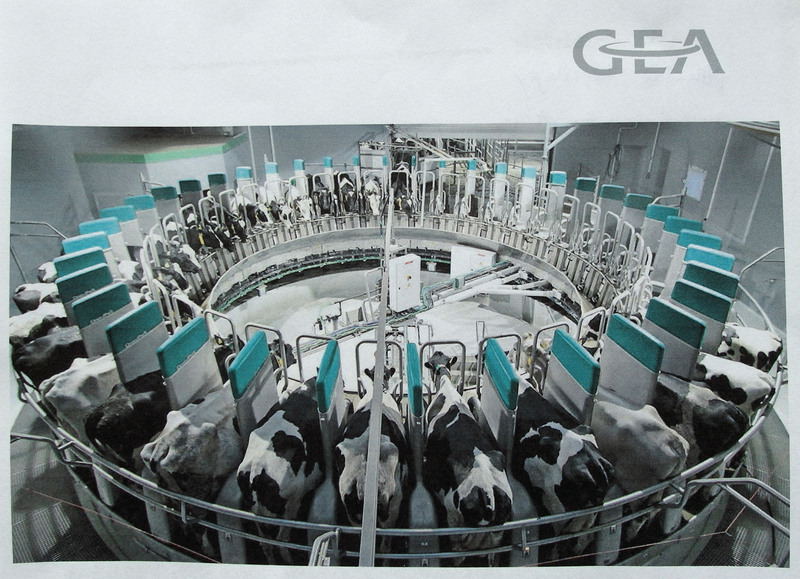 Already at Euro Tier 2012, the world fair for livestock husbandry in Hannover, the innovative prototype of milking plant caused great interest among cattle breeders and was awarded with the gold medal from DLG (German agriculture association). Due to the increased throughput rate and a continuous milking process, the plant is appropriate for large cattle and dairy farms. An innovative service concept also allows preventive maintenance, interim cleaning and disinfection during normal operation. The agricultural cooperative Agrargenossenschaft Teichel e. G., founded in 1991, has invested about Euro 8.7 million for the development of its subsidiary MKH Agrar GmbH in Teichröda in the last two years. The small village is situated in Thuringia, which is also called the “Green Heart of Germany” because 30 per cent of the federal state is covered by forests as well as by large fields, pastures and meadows. The dairy farm of Teichröda lies in the district of Saalfeld-Rudolstadt about 40 kilometres (25 miles) southwest of the university town of Jena, where Carl Zeiss, Ernst Abbe and Otto Schott already left their marks and invented new technologies and materials. The farm comprises of two new airy and bright cow barns with huge fans at the ceiling for air conditioning, a biogas plant for producing green energy and several halls for storing forage and manure. 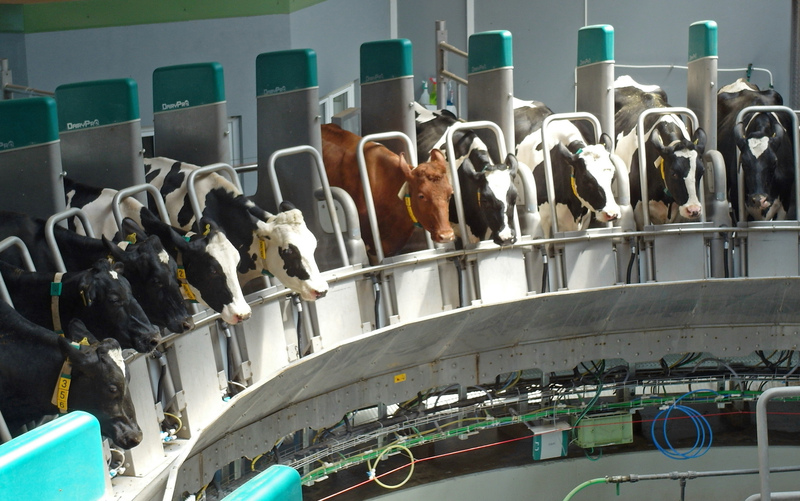 However, the carousel-like milking plant, which was designed for a pilot project and tests in real operation, is the centerpiece of the dairy farm. With its 40 boxes arrayed in a diameter of 15 metres (16 yards), the DairyProQ in Teichröda has been the biggest one of its kind after the testing phase since 2013. However, as the milking plant is constantly enhanced, the manufacturer already plans to increase its size up to 80 milking boxes, and the next milking plants are already scheduled in Thuringia, Germany and near Cashton, Wisconsin, USA. Today the agricultural cooperative counts 139 members and 38 employees, who not only care for the 382 dairy cows but also for five French Charolais breeding bulls and 160 calves as well as 800 pigs, 90 geese, 950 ducks and about 150 red and fallow deer. As the valleys around Teichröda are situated at an altitude of 250 to 500 metres (820 to 1640 feet) above sea level and there is an average rainfall of 500 millimetres (20 inches), the region is suitable for reaping wheat, barley, rye, oat, corn, rap and alfalfa, too. Jörg M. Unger is a freelance writer and photographer from Thuringia, Germany, who has been working for English travel and consumer magazines, papers and websites for about 17 years after he finished a freelance writing course with the Long Ridge Writers Group in West Redding, Connecticut from 1996 to 1998. Since 2008 he also belongs to the editorial team of DAS FENSTER, the most widely distributed German language magazine in North America. To keep the large German-American/Canadian community informed, he has specialized in trendsetter articles and entertaining puzzle stories on famous inventors, entrepreneurs, musicians, poets and other well-known Germans.